Just a reminder that this month we are encouraging people to go to the Friends of Bowland event tonight, Thursday, at Looking Well, for your Green Cafe fix. Tania St Pierre will be talking about a Buzz in the Meadows bumblebees, wildflowers, pollination from 7.30 – 9.00pm. This is at Looking Well Studios, King St. High Bentham. A new sports pavilion could generate energy for itself and cash for the community. We’ll be looking for the best Low Carbon option. Join us to find out more and to share your views! 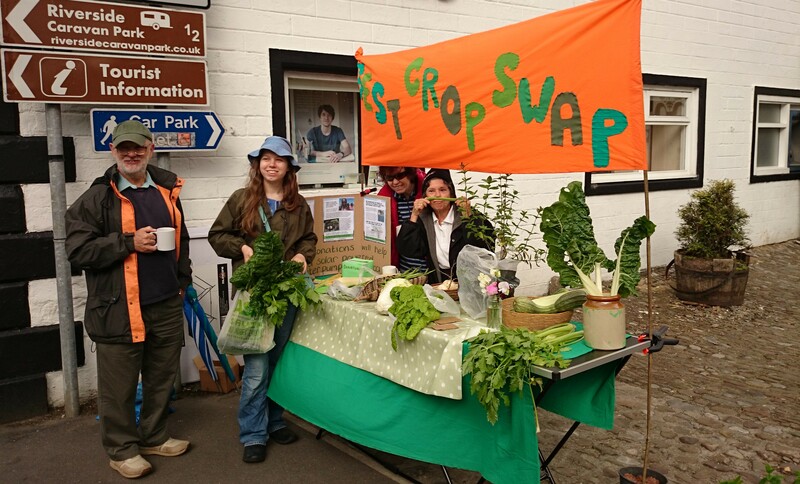 Green Cafe tomorrow – all about the “Local Plan” & CARnival Bentham awards prizes for B.E.S.T. damselfly. B.E.S.T. 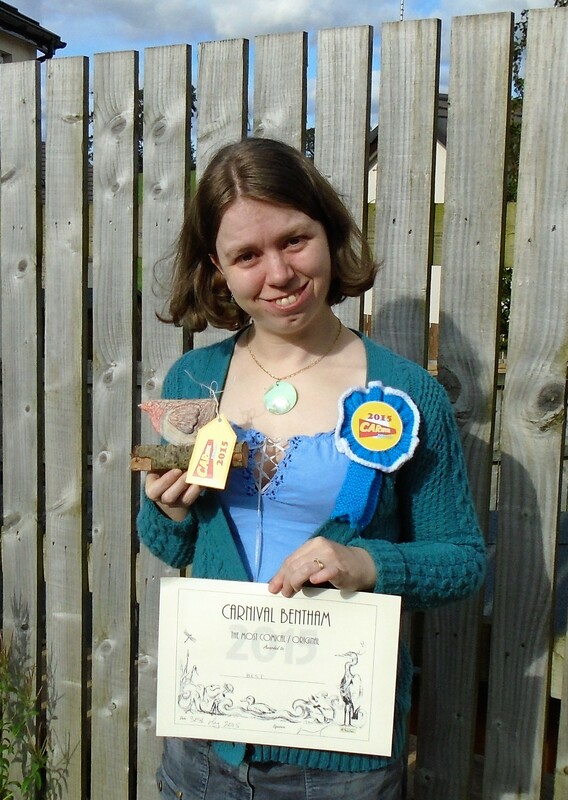 was awarded a “most original” certificate a hand made ornament of a robin (made by Sue Halsall) and a fantastic hand knitted rosette by CARnival Bentham for Collette Austin’s carnival damselfly which was made entirely from re-used waste, (e.g. plastic bottles, tin foil, plastic bags etc.). Sorry for the delay in posting this up – it was a case of getting round to taking the photo! We’re discussing the Local and Neighbourhood Plans – which will have all sorts of implications for developments to be green – or not. It will be really good chance to get our heads around what they mean for us, how we can be involved, what we would like to see included.- so it would be great if you came along! Please click the link below to see the latest draft of the plan before tomorrow night. Crop Swaps & Best Meeting! Our next meeting is in the Horse and Farrier, Main Street, High Bentham at 7.30 on Tuesday 18th August. All Welcome! BEST Carnival Damsel-fly in Carnival Bentham parade tomorrow! Don’t miss it! Collette has made this damsel fly which fits in with the Carnival’s “Tales of the Riverbank” theme and is a subtle comment on the unfortunate dumping of waste plastic in our local river (the Wenning). It is entirely made out of waste plastic. Many thanks to Kathleen Kelly, Peter Knowles and Rachel (sorry don’t know surname) for donating their waste plastic. 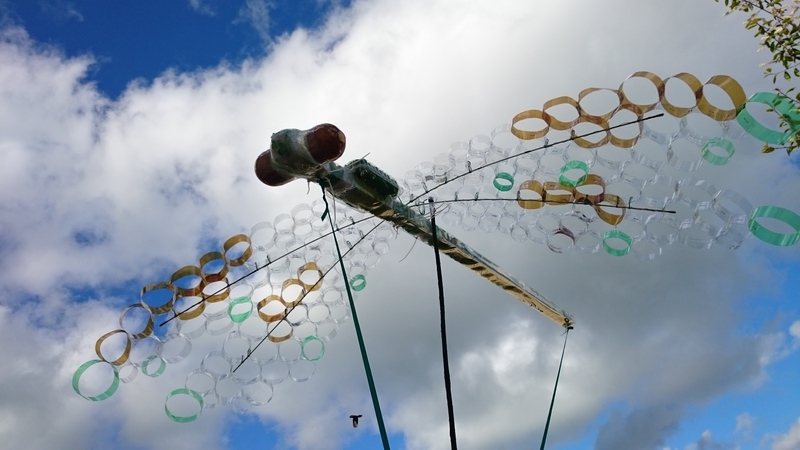 Please come along and support the Carnival tomorrow and you’ll be able to see this giant damsel-fly in the parade at 1.30pm (assemble in car park from 1.00pm if you’re part of the parade). Well done on Give & Take Day Everyone! Thanks everyone for all your help – so many of us so willing that none of it felt like a chore, I think. So much came in, so much went out. So many people happy! At the end we had collected about £90 which I think nearly covers costs. Sue Ryder took a couple of boxes of knick knacks; Edward collected not very many books; a couple of cars went via Low Bentham for the next Institute fundraiser. Linda and I took the rest over to Settle – and a good bit of that went to Age UK (for future ref, they loved the big ring files) so really very little ended up in the dump. And a special bonus – on the way back we picked up a hitch hiker – who turned out to be the benighted cyclist who had cycled home on Bobs bike and was now on his way back to Bentham to repair and collect his own! Give & Take & Hay Meadow Green Cafe! Hi everyone – March is a very exciting month for BEST and also for all Bentham folk with unwanted stuff cluttering up their house/garage/shed and also for people who like taking away free stuff and stopping it going to landfill!